Human development everywhere depends upon the availability of natural resources, and it is the sustainability of these resources (water, minerals, and environmental resources and habitat) that is the primary concern of geoscientists worldwide. Geology is the foundation for sustainable global development, and so it is also key to the peaceful co-existence and cooperation of nations and the welfare of future generations. The need for scientific and cultural cooperation is acute at this moment in history. Never before has mankind been faced with the kind of cross-border and global challenges we face today that can only be conquered through sustained efforts supported by a large number of nations. For these reasons, it is crucial that geoscientists from all nations work together to solve cross-border problems related to natural resources and environmental degradation, but cooperation of this type is increasingly rare. Given the global problems now facing humanity (climate change, poverty, loss of habitat, famine, etc. ), we must design new models for working together so that we can effect real change to benefit future generations. We must get beyond the politics that separates peoples and nations. Abundant evidence of the importance of geology to sustainable global development can be found in the literature, and one good example is a 2016 Special Paper from the Geological Society of America. 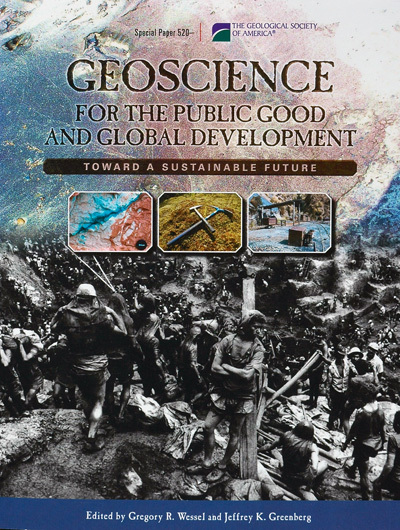 In this volume, papers from all over the world describe the importance of geology and geological engineering to human development, and also illustrate the difficulties people face when poverty and associated deficits hamper efforts to deal with dwindling water supplies, exhausted mineral and energy resources, and widespread pollution and contamination. To advance this goal, we are working with nine other internationally recognized geoscience organizations to host a conference to examine ways we can collectively remove obstacles to working together across cultural and national divides. The meeting is titled Geoscience and Society Summit: Bridges to Global Health, Resilience and Sustainability, and the ten cooperating organizations include the American Geophysical Union (AGU), Geology in the Public Interest (GPI), the Bolin Centre for Climate Research at Stockholm University, the American Geosciences Institute (AGI), the Geological Society of America (GSA), the Geological Society of London (GSL), Geoscientists Without Borders (GWB), Geology for Global Development (GfGD), the International Association for Promoting Geoethics (IAPG), and the Department of Geology and Environmental Science at Wheaton College, Illinois. All ten are contributing planning and programming assistance, as well as marketing assistance, but it is the AGU that is taking the lead and handling the logistics of the meeting and the overall budgeting. 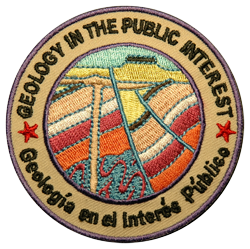 Geology in the Public Interest is a co-host because it was at our suggestion that the meeting be held. GPI is also leading the effort to design the technical program for the meeting. The Summit will be held in Stockholm in March of 2019. The best way for you to keep up-to-date on the Summit is to visit the Summit’s home page (https://connect.agu.org/gss/home) where developments and announcements are posted. A “Call for Innovations” (ideas and comments rather than conventional abstracts) has been issued and instructions for submitting innovations, as well as information on registration and housing, is available at the web site. Please join us in Stockholm for this important meeting. Working together, we can overcome some of the artificial obstacles that separate us and craft a better world for future generations.